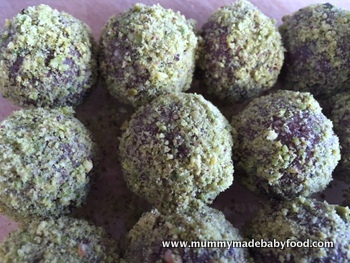 This guilt-free baby snack of raw chocolate truffles - so named because their shape resembles that of the fungus variety - is one for the whole family to enjoy. 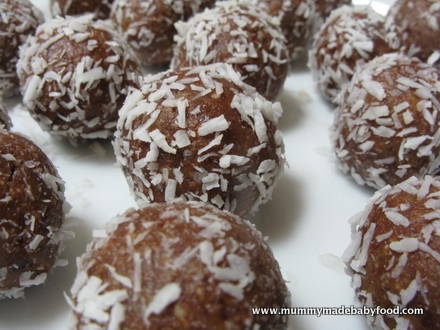 They look like truffles, smell like truffles, and even taste like truffles, but they are made with good stuff only and completely sugar-free, so they don't give you the crazy highs followed by crashes that consuming a lot of refined sugar can, and you truly don't need to feel guilty, even after a binge eating session. And, as we love nuts around here, I have dusted mine in ground pistachios, but feel free to use your dusting ingredient of choice. All the ingredients in this recipe are raw, which means they retain their full nutritional benefit, and the only sweetness comes from the dates. These raw chocolate truffles are the perfect after school snack for older children, but toddlers and older babies love them equally! Although commercially available chocolate is derived from cacao beans, the cooking and processing required to convert cacao into chocolate means that very little of the original nutrients are remaining once in chocolate form. Despite popular thinking, chocolate - and therefore raw cacao - does not naturally contain caffeine. They do both contain theobromine, which is closely related to caffeine but does not stimulate the central nervous system as caffeine does. Raw cacao does not make you jittery like coffee can, though you may choose to reduce the amount added to this baby snack if making for smaller children or leave it out all together for babies. Raw cashews are also chock full of health benefits, including having a lower fat content than most nuts, and also having the vast majority of their fat being unsaturated fatty acids. And Medjool dates, aside from being the sweetening ingredient, possess numerous health benefits themselves, including containing no fat whilst being loaded with calories, carbohydrates and protein. So finally you have a sweet treat which you should be trying to eat more of rather than less! This recipes yields approximately 18-20 mini truffles. Using a spice blender or nut mill, grind the pistachio nuts until they become a fine powder. Place the ground pistachios in a bowl, and set aside. Put the cashew nuts into the bowl of your food processor, and blitz for a few minutes until the nuts are mostly broken up. Roughly chop the dates, and add them to the bowl of your food processor, with the cashew nuts. Blitz for a few more minutes until the dates re mostly broken up. Add the cacao powder, and continue to blitz until all the ingredients are fully incorporated and the mixture starts to come together. Take about a tablespoonful of the mixture, and shape it into balls, gently rolling it between your palms. Roll each ball in the ground pistachio until all surfaces are coated in a light dusting. Enjoy, and try not to eat them all in one sitting! You can roll the truffles in any ground nut of your choosing, or try desiccated coconut, for a crunchy texture that's full of goodness.